M83’s Epic “Hurry Up, We’re Dreaming” Nominated for Grammy Best Alternative Music Album! GRAMMY nominated for "Best Alternative Music Album" ( see all the  55th Annual GRAMMY Awards nominees here ) M83 is a blend of shimmering synths, ambient pop and progressive textures. 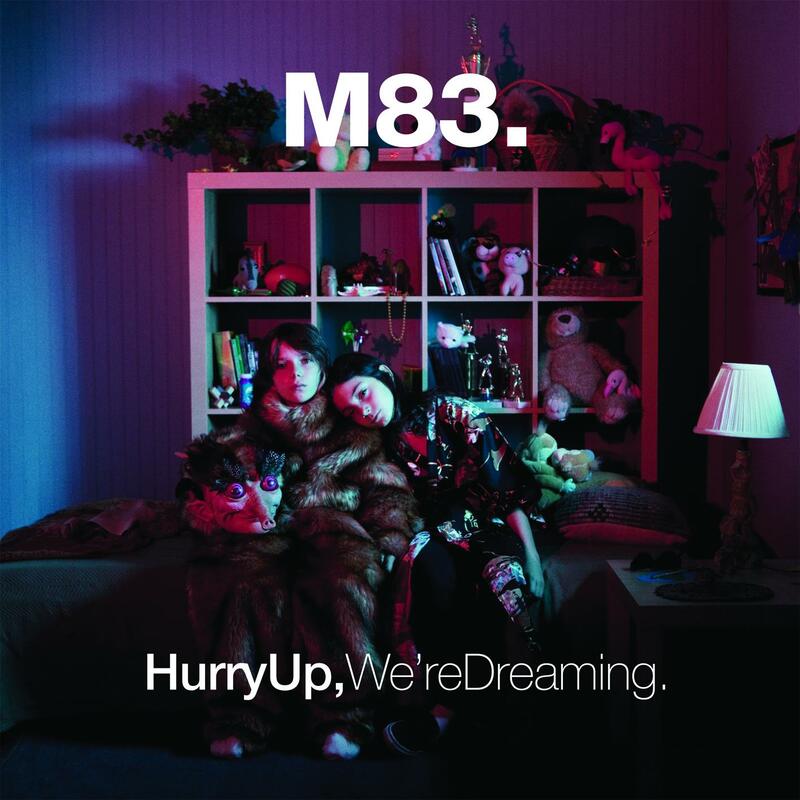 L.A Based and French-born M83- Anthony Gonzalez has a winner on his hand with the double album  "Hurry Up, We're Dreaming." “M83 is a French electronic/shoegaze band from Antibes, formed in 2001 by Anthony Gonzalez and Nicolas Fromageau. The band is named after the spiral galaxy Messier 83, and its musical aesthetic is influenced by shoegaze in its extensive use of reverb effects and lyrics spoken softly over loud instrumentals, although M83’s songs employ considerably less guitar than most shoegaze bands. “Plain big is not so hard to pull off. Queen’s “Bohemian Rhapsody”, Pink Floyd’s “Comfortably Numb”, Harry Nilsson’s “Without You”, Jimmy Webb’s “MacArthur Park”, Guns N’ Roses’ “Sweet Child o’ Mine”…rock history is landmarked with preposterously massive songs that are often bloated and overwrought, songs that stand as giant signposts to feeling, but communicate little actual emotion. Grand-scale songs may be impressive, but filling tunes of a synapse short-circuiting enormity with real emotional resonance – making them memorable for reasons other than size – is much more difficult.It’s a talent Anthony Gonzalez has clearly mastered with ‘Hurry Up, We’re Dreaming’, a double album that brokers a brilliantly effective accord between the ostensibly conflicting demands of ’80s commercial pop and experimental rock, and packs some truly giant tunes. The Antibes native has been steadily working to perfect the art of the megalithic alt.pop song since founding M83 in 2001. His self-titled debut from that year and sophomore release two years later, ‘Dead Cities, Red Seas & Lost Ghosts’ established him as a heavy hitter in the post-rock/bliss pop/cosmic electronica league, a skilled producer of hazy, lusciously layered, irresistibly narcotized, epic dreamscapes crafted (essentially solo) from treated electronics, plush synths, murmured vocals and fx-heavy guitar. Third album, ‘Before the Dawn Heals Us’ (2005) upped the cinematic, star-spangled ante but added a dark strangeness, while in 2007 M83 released the entirely ambient ‘Digital Shades Vol 1’. It was 2008’s ‘Saturdays = Youth’, a nostalgia-soaked paean to Gonzalez’s teenage years – and an unashamed celebration of artists such as Kate Bush and Jean-Michel Jarre – that paved the way for the monumental ‘Hurry Up, We’re Dreaming’.Co-produced by bassist Justin Meldal-Johnsen (known for his work with Beck, NIN, The Mars Volta, Goldfrapp), it took just 13 months to complete and features guest vocalists Zola Jesus on ‘Intro” and Brad Laner (from 90’s band Medicine) on “Splendor”, plus contributions from Gonzalez’s long-term collaborator, his brother Yann. The album title is also a neat summary of the record’s twin tempers – urgent and introspective – and of Gonzalez’s dual identity as dance floor enthusiast and solipsistic muser. So, “Midnight City” is a huge chunk of glittering and euphoric nu-disco that somehow joins that dots between Peter Gabriel and Underworld, and features not only that big no-no of contemporary pop – a saxophone solo – but also a fade-out. “Reunion”, too, is built on a triumphantly massive scale, its layer-cake vocals suggesting Toto as produced by My Bloody Valentine, while “Claudia Lewis” ramps up M83’s feelings for ’80s music from affection to passionate love, even sneaking in the slap bass usually verboten by the contemporary pop police.Conversely, “Where the Boats Go” wraps woozy pop soundscapes around a sombre piano coda, the aptly titled “Splendor” summons a divinely doomed, synth-centric romanticism and the album’s wild card, “Soon, My Friend”, drops all things electronic in favour of acoustic guitar, strings, brass and a choir. “I like the fact that the album is like a rollercoaster,” Gonzalez says. “Sometimes it goes fast, and then it will slow down for a while. You can’t stay at the same tempo all the time.” This is an album that’s epic not only in terms of scale, but also of structure, with both an intro and an outro, and brief tracks like “Train to Pluton” and “Fountains” functioning as interludes. M83’s music has long been acknowledged as cinematic, not least of all by Gonzalez himself, who’s a huge film fan (Terrence Malick’s ‘Days of Heaven’, ‘Nowhere’ by Gregg Araki, Werner Herzog’s ‘Aguirre, the Wrath of God’ and Todd Haynes’ ‘Safe’ are some of his favourites). This entry was posted in Music Biz, Music Events, Music Press and tagged 55th Annual GRAMMY Awards, Anthony Gonzales, Anthony Gonzalez, France, Frank Ocean, GRAMMY Award, Grammy Award for Best Alternative Music Album, Hayley Williams, Hurry Up We're Dreaming, Jean-Michel Jarre, Justin Meldal-Johnsen, Los Angeles, M83, Paramore, Pink Floyd, The Grammys. Bookmark the permalink.